Meghan Markle once wrote about being a Princess, long before she married Prince Harry. 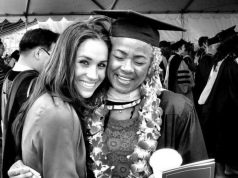 Before becoming a member of the Royal Family, Meghan was a successful actress and also had a popular blog called ‘The Tig’. In a blog post from four years ago, Meghan discussed her dream of becoming a (fictional) princess, as she introduced her interview with exiled Libyan Princess Alia Al-Senussi. “Little girls dream of being princesses. I, for one, was all about She-Ra, Princess of Power,” she wrote, before admitting that she “had a bit of a ‘pinch-myself-I’m-emailing-with-a-princess’ moment” ahead of her chat with Princess Alia. In a funny turn of events, Meghan then referenced her now sister-in-law, Kate Middleton, and her royal wedding to Prince William. “Grown women seem to retain this childhood fantasy. Just look at the pomp and circumstance surrounding the royal wedding and endless conversation about Princess Kate,” she wrote. Meghan started her lifestyle blog in 2014, which was dedicated to travel, food, fashion and beauty. However, Meghan shut the site down in April 2017, months before she announced her engagement to Prince Harry.